Everyone knows living in Van is far from cheap. From artisan coffee shops on every corner to multi-million dollar bungalows, no one said making it in the most liveable city in the world would be easy. But what if there was a way to get ahead while giving back? Hollyburn Properties, a national property management and development company, is holding a contest that will reward one community champion with the opportunity to live in a one-bedroom apartment rent-free for a whole year. That’s around $18K of paying-it-forward. Go online and nominate yourself or someone you know by October 31, 2015. Describe how you, or someone you know, give back to your community. This can be through volunteering your time, donating to social initiatives, or contributing in your own way to bring your community to life. A judging panel will select three top finalists, whose profiles will be publicly voted upon starting the week of November 9 until November 30. Make sure to visit hollyburnfreerent.com to vote on who you think deserves to win! The free-rent-winner will be announced early December, 2015. For more details and guidelines, watch the YouTube contest video, or visit the Hollyburn Free Rent Contest website. Not a renter? No worries, you can still win a $250 Visa gift card! This is an exclusive Vancity Buzz contest provided by Hollyburn Properties. 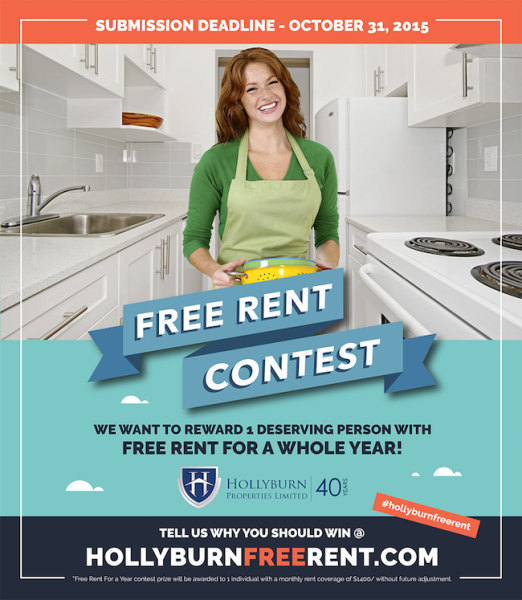 Win a VISA gift card & #HollyburnFreeRent via @HollyburnPpty & @VancityBuzz http://ow.ly/TNzTz RT to enter! Contest entries will be accepted from the time and date of publishing until 11:59 pm PST on November 30, 2015. One winner will be chosen at random and contacted through the platform they enter by.